GKIDS Films and Fathom Events are back with another Studio Ghibli classic on the big screen, as Ghibli Fest 2018 continues. Next up in the series is the 30th Anniversary screening of Grave Of The Fireflies screening On August, 12, 13 and 15. And once again we've teamed up with GKIDS to give you a chance to win a pair of tickets to a screening near you. Grave Of The Fireflies is the moving anti-war masterpiece from the late, great Isao Takahata. It follows two children caught up in the fire-bombing of Japan during World War II. The contest runs from midnight July 30 to 11.59pm August 5 (all times Eastern). The winners will be selected and notified by GKIDS Films after the closing date. US entries only. All you have to do is enter using the widget below, or via this link. Not lucky enough to win? Get tickets here. And don't forget to bring tissues. Directed by Academy Award®-nominated Isao Takahata, Studio Ghibli’s Grave of the Fireflies has been universally hailed as an artistic and emotional tour de force. As the Empire of the Sun crumbles upon itself and a rain of firebombs falls upon Japan, the final death march of a nation is echoed in millions of smaller tragedies. 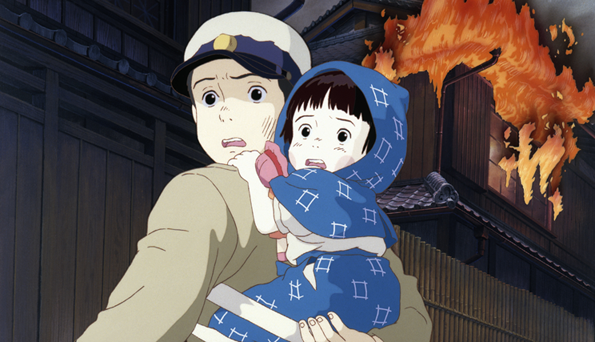 This is the story of Seita and his younger sister Setsuko, two children forced to fend for themselves in the aftermath of fires that swept entire cities from the face of the earth. Their struggle is a tribute to the human spirit. Presented in its digitally remastered and restored format, Grave of the Fireflies is one of the rare films that truly deserves to be called a masterpiece.